Gaming peripheral and system maker Razer shows up at CES 2016 this week its smallest, cheapest Razer Blade laptop yet. The Razer Blade Stealth is Ultrabook sized, but with the optional Razer Core it can deliver desktop-level performance. They’re calling the Razer Blade Stealth the “Ultimate Ultrabook”, and the specs fit the moniker. A mere .52 inches thick and weighing only 2.75 pounds, Razer has packed the best bits that’ll safely run inside the smallest version of the distinctive aluminium Razer Blade housing yet. Depending on the configuration, those bits include an Intel Core i7-6500U dual-core processor running at 2.5 or 3.1 GHz, SSD drives from 128 to 512 GB, 8 GB of dual-channel system memory and either a 2560 x 1440 QHD or 3840 x 2160 12.5 inch UHD multi-touch indium gallium zinc oxide display. And the keyboard lights up, thanks to the power of Razer Chroma technology. Each individual key can do its own thing. I’m a big fan of this. The integrated Intel 520 graphics chip should be enough to handle most modern games at low settings or better, which is great for the Ultrabook form factor, but Razer is a gaming brand, so they’ve prepared a little something to help boost that performance. It’s a box! This is the Razer Core, and it is a box built to house up to a double wide full-length graphics card of the desktop variety. It’s got four USB ports, a high-speed ethernet port, and two different light-up areas to ensure folks know this is a Razer product. The Razer Core sits on your desk with a Thunderbolt cable hanging off of it. Plug that cable into the Razer Blade Stealth and it instantly begins to supply data, electricity and graphical power to the Ultrabook. Suddenly those product shots with the generic rainbow pattern become product shots featuring Fallout 4 wallpaper, because marketing. It’s sort of like the Alienware Graphics Amplifier. Incredibly like it. Almost exactly it. 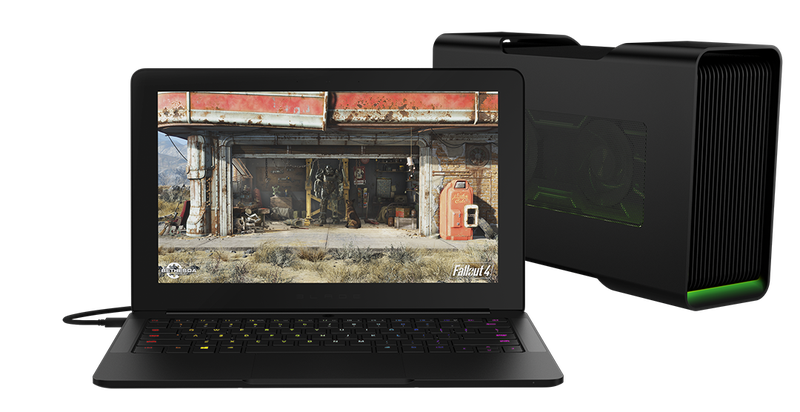 Plug an external mouse, monitor and keyboard into the Razer Core and suddenly that Ultrabook is a 4K gaming system. A 4K gaming system with only 8GB of RAM, but still impressive. What’s most impressive about the Razer Blade Stealth however, is the price. Since Razer is selling the system in their own online and offline shops when they launch in January (the Microsoft store begins selling them in February) they can keep the price relatively low compared to the competition—the Razer Blade Stealth starts at just $999, with the highest-end version ringing up at $1,599. There’s still no price on the Razer Core, though since its just a box with connectors and cooling it shouldn’t be too expensi. The Razer Blade Stealth is now on sale at the Razer website, with shipping starting January 29. The Razer Core will ship in the first half of 2016. I leave you with system specs.